When you think of portable generators, all kinds of things may come to mind. If you are considering investing in a generator, you are probably thinking of a very specific purpose. Maybe you need to use some corded power tools in a remote location, and don’t have a way to power them. Perhaps you are someone who often gives this advice: “I would rather have one and not need it than not have one and need it.” The Yamaha EF2000is will give you peace of mind. Is the Yamaha 2000 generator water-resistant? I’m looking for a generator I can run during a hurricane, but everything I've read says I can't run it indoors. What is the fuel tank size? How long will one tank run for at the maximum rated power output, 1600 watts? Can I use this generator to power tools such as a saw or nail gun at small job site? 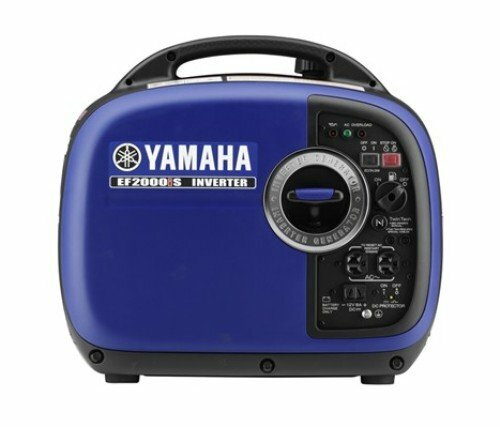 How do I start the Yamaha EF2000is portable generator? Does this generator have an electric start, or only a pull-cord start? Where are the instructions for the Yamaha Generator EF2000iS? I can’t seem to find the manual in the box. How loud is this generator? How Do I Secure this Portable Generator? Do I need to buy a separate housing or enclosure for it? How long does Yamaha cover this generator with a warranty? Can I use ethanol gas in the Yamaha EF2000iS Generator? Or only use regular unleaded? Does this unit output 220v? If not, how do I make it to do so? Will this generator power a 5,000 btu air conditioner? If so, will it do it in Eco-mode? Does the gas need to be mixed with oil before adding them to the generator? What's the difference between a Portable Conventional Generator and a Portable Inverter Generator? Why is the quality of the electrical current so important? In the 21st century, the developed world enjoys a standard of living that the richest kings in the world could not imagine only 200 or 300 years ago. However, much of what creates our high-quality lifestyle depends on electricity. The electricity that powers your home likely traveled many miles to get to you. When tornadoes, hurricanes, or floods threaten your neighborhood, the fragile power grid is often knocked out. In especially severe natural disasters, people may be without power for weeks. Having a portable generator can mean keeping critical appliances running. This can be a big deal when the alternative is a dead cell phone and a fridge full of rotting food. Run your business, even when the power goes out. In most businesses, losing power means losing the ability to take payments for your goods or services. Even when mobile payment technology like an iPad with an attached card swipe is being used, the internet connection is coming from local WiFi, not from a data plan. Even if your internet connection is working fine, without power your router can’t get that connection shared to your devices. Depending on the type of business you run, a major power outage might even be the most important time to keep your doors open for customers. As long as you have a safe, well ventilated space outdoors to run your generator, this is an excellent solution. Take the comfort of your own backyard with you, anywhere. Having a small party in your back yard is one thing. Running an extension cable outside to power a bug zapper is easy. Having a party miles away from civilization while still enjoying the same luxuries of your backyard? That’s something else entirely. Toaster ovens, bug control devices, space heaters, small refrigerators, area lighting, and many other things can all be powered with a portable generator and a supply of fuel. Use power tools in remote locations. Perhaps the most common use of portable generators is for new construction in an area that does not yet have dedicated power lines. Things like table saws, nail guns and large lighting arrays all require power. Even if some of these devices can be run on batteries, a way to recharge the batteries is still needed. A portable generator allows crews to remain on site to finish their work more quickly and efficiently. Now that you know the needs that portable generators help to meet, let’s take a look at the more specific features of this Yamaha generator. This gas-powered generator supports continuous loads up to 1600 watts. It can also provide up to 2000 watts for a brief time for appliances. This is helpful because some require an initial boost of power to start (a motor, or refrigerator, for example). It provides clean electricity using its inverter system, which won’t damage delicate appliances. The Smart Throttle Load feature allows it to adjust the engine speed based on the output required. This gives it a fuel-efficiency advantage that conventional generators just can’t compete with. It weighs about 44 lbs and is similar in size to a standard, compact suitcase. This makes it extremely easy to transport, in a car, RV, or even a boat. The TwinTech feature lets you provide electricity for larger loads by simplifying the connection of two of these generators. A super-quiet muffler, vibration-isolating feet, and noise-absorbing glass construction helps dampen noise even under at full capacity. Buying a generator is an investment. Doing your research before buying is essential. After all, you want to select a generator that will both meet your needs and that you’ll be happy with over the long term. Most people will only need a single portable generator to meet their power needs while away from home or during a power outage. Like any generator, this Yamaha 2000 watt generator model gets a lot of questions regarding what you can and cannot do with it. Let’s take a look at those questions. No, this Yamaha 2000 watt generator is not water resistant. The owner’s manual explicitly warns not to use it in the rain. To protect it from the elements, you can put this generator inside of a protected area. Some common suggestions are to use a dog house, or child’s plastic playhouse. This is a great location to set up the generator, so long as there is adequate ventilation and a dog or child won’t be using the structure. The generator can get really hot, so make sure there’s an adequate opening for the exhaust to prevent the generator from overheating. However, I would not run the generator during a severe thunderstorm or hurricane. I would wait until the storm passes to start the generator. The ventilation needed for the right amount of air circulation would also let rain pour in during such a severe storm like that. As a safety reminder, never run a generator inside the house, in the garage with the garage doors open, or under a roof overhang. The fumes and exhaust will flow back into your house. Carbon monoxide poisoning﻿﻿ is a very real safety concern. Set up the generator downwind of your house, and make sure the exhaust isn’t flowing towards your neighbors either. Always install a carbon monoxide detector inside your house when you're using a generator. The tank holds a little more than 1 gallon of regular gasoline. On a continuous full load, this generator would run for an estimated 3 to 3 ½ hours. This is an estimate, based on running an intermittent air conditioner. In this example the tank runs for about 5 hours. For most projects, you can expect to get around 7-9 hours from one gallon. This will vary based on the power load. If you need a longer run time, there are extended run kits available for this generator. This saves you the trouble waiting for the generator to finish, cool down, and then add more fuel. The kits generally include an external tank, which are then connected to the generator with a hose and a special gas cap. This gas cap replaces the one that comes with the generator, so be sure to put the original in a safe place! Actually, this generator is ideal for that kind of task! For the power it can provide, the size is almost too good to be true. It weighs less than 50 lbs, and is about the size of a compact suitcase. It’s very portable, and can fit into any vehicle, meaning you can take it wherever you need to. In provides up to 1600 watts of continuous electricity, so you can power anything that has a load smaller than that. In addition to power tools, you can use it power things like hot plates, furnaces, or even small window air conditioning units. Keep in mind how much load you are putting on the generator! A saw will may not cut as well as you are used to if it is underpowered from too many things running simultaneously. This generator is a pull-start only. If you’re used to gas-powered tools like mowers or chainsaws, there is not much to learn. There are only a few more switches to figure out. Luckily Yamaha provides clear instructions so that even those completely unfamiliar with gas-powered tools can learn to maintain and operate their new generator safely. Set up the generator outdoors, in a dry, well-ventilated location, away from your house. Unscrew the gas cap, add new unleaded gasoline up to the red level, and screw the cap back on. Ensure it is secure. Check the oil level. You do this by removing the screws and the cover on the side to expose the oil filler cap. Remove the cap, and fill with the recommended engine oil all the way to the upper level. This generator is sensitive to the oil level and will automatically shut off if it thinks the level is low. Take the time to top off the oil level all the way to the top of the fill plug hole, to prevent the generator from shutting down sooner than expected. After checking or topping off the oil, be sure to screw the oil fill plug back on, and screw the cover back on. Turn the air vent knob to “On.” Be sure to hold the fuel tank cap to prevent it from moving! Pull the choke knob all the way out. This step is not necessary when the engine is still warm from previous use. Pull the start cord out slowly until you feel resistance. Then, pull the starter handle, taking care not to pull the cord beyond 12 to 14 inches. Pull rapidly until the engine starts. Allow the engine to warm up before pushing the choke knob back in. Turn off any electric devices powered by the generator. Turn the black economy switch to "Off." As you can see, once you learn the start up and shut down routine, it’s not complicated to operate a portable inverter generator! The manual is in the box for the generator, along with various cables. The generator is packaged in such a way that there is a vertical piece of cardboard that pushes the manual against the side of the box. It’s easy to miss it, and you’d be surprised at how common this complaint is! This portable generator is quieter than you would expect. At a quarter of the max load, it only generates around 51.5 dB of sound. This level is comparable to the hum of an air conditioning unit, which makes it one of the quietest models. Of course, the sound will get louder as the load increases. At 10-15 ft away, you can still have a comfortable conversation with another person. To secure this generator, you can first slip a chain or bicycle lock through the handle and then lock it to a fence or deck post. Securing the generator is not a requirement, however. Just make sure it’s on a flat level surface, in a well-ventilated spot outdoors, and you’re good to go! For the EF2000iS, Yamaha offers a 3 year limited warranty, regardless of residential or commercial use. But, receiving warranty coverage can be difficult. Yamaha will not cover damage or failures caused by abuse, lack of proper maintenance, or accidental damage. Anything Yamaha would consider normal wear and tear will not be covered. Excessive corrosion from salty air if you live near the beach would also not be covered. To receive warranty coverage, you will need to notify an authorized Yamaha service dealer of all defects within ten days of discovery. You are also responsible for transporting the generator to and from the service center. Whether that’s by taking it to the center yourself, or having it shipped and returned, is up to you. If you can’t locate a service center within driving distance, needing to ship a heavy generator for repair can get expensive! Although getting warranty service can be tricky, the warranty can be transferred. The generator will need to be inspected by an authorized Yamaha generator dealer, who can then register it on behalf of the new owner. The new owner will then be covered for the remaining warranty period. However, you should expect the dealer to charge an inspection fee, as an inspection is not covered by the warranty. The inspection must take place within 10 days of transferring the generator to its new owner. Ethanol gas can be used with the generator, but it’s very important to consider the percent of ethanol in the gas. Yamaha recommends using unleaded gasoline with a pump octane number above 86, or with a research octane number above 91. The biggest consideration with using gas with ethanol is that old ethanol gas can gum up and cause the engine to knock. If you consistently shut down the generator and allow it to completely run out of fuel before storing it, you shouldn’t have any problems. If you need to extend the shelf-life of your fuel, you can also purchase a stabilizer that will treat and neutralize the ethanol. The EF2000iS can only output 120v AC or 12v DC. There are no modifications you make to it to make it compatible with 220v/240v. So, if you need 220v AC, you’ll need to select a different model. The generator has a running wattage of 1600 watts. To find the amp capacity, divide the 1600 watts by 120 volts, which gives you a little more than 13 amps. As long as your air conditioner doesn’t draw a continuous load of more than 13 amps, the generator will power it. Of course, your air conditioner may require more than that to start. This generator can support an initial starting wattage of 2000 watts, or 16 amps. When the air conditioner compressor cycles off, the generator will continue to use all of the fuel until it runs out because it is idling on low speed. If you set the generator to eco idle mode, you can prevent this from happening. When the compressor cycles back on, the generator will automatically go back to running as needed to keep the compressor running. No, the Yamaha EF2000is has a four stroke engine, so the gas and oil are separate. This generator does not come with oil. Yamaha recommends using 10W-30 or 10W-40, and the engine holds 0.4 L (.42 US qt). Portable conventional generators are about the same size and weight as inverter generators of the same watt capacity. The higher the wattage, the more likely both varieties will have wheels for portability. The smaller the wattage, the easier they are to pick up, transport, or fit into your RV, boat, or car. Conventional generators typically run at 3600 rpm, regardless of the power load. Inverters are more fuel-efficient because the engine speed adjusts based on the power load required. Conventional portable generators have a larger tank, helping them to have about the same run time on a continuous load as an inverter generator. Where the inverter generator comes into its own is with intermittent power needs. If you need power for an air conditioner, space heater, or refrigerator, an inverter generator will provide a much longer runtime. This is because it will not waste as much fuel while it idles. Inverter generators are also much quieter than conventional generators. Conventional generators are about the same noise level as a chainsaw or lawn mower, and this noise level is constant. Silenced conventional generators are available. In these models, the sound is merely dampened by its padding and acoustic cabinet. You’re not going to be able to have a normal conversation within 10 to 15 feet of a conventional generator while it’s running. This is regardless of the load it’s producing. On the other hand, inverter generators can adjust their engine speed. Since the engine speed is the primary source of noise, the noise is in direct relation to the power load the engine needs to supply. When the load decreases, so does the noise. Most are so quiet that even on a full load, you can carry on a normal-level conversation just a feet away from the generator. You can buy a conventional generator with almost any max wattage that you could think of – as low as 500 watts, and all the way up to 50,000 watts or more. Inverter generators have a much more limited range for their maximum output (from 1000 to 6500 watt models). This is because they are marketed towards portability and quiet operation. Simply put, a conventional generator uses some kind of fuel to power a motor that is attached to an alternator in order to produce electricity. The motor will run at a constant speed to produce the required electrical current. The engine’s speed should never fluctuate. Otherwise, it will produce the wrong frequency of electrical output. Fluctuations in the current can cause irreparable damage to whatever is receiving that power. However, as the load increases the engine will throttle up to keep the engine speed the same. On the other hand, inverter generators are more advanced. Inverter generators produce a current just like conventional generators, but then use a rectifier to convert the original AC power to DC voltage. Capacitors are also used to smooth out the voltage. Then, the DC power is inverted back to AC at the desired voltage and frequency. This kind of system will produce consistent power regardless of the engine speed. This stabilizes the flow of electrical current to your appliances, and makes it much safer for sensitive equipment like computers. The quality of power produced by an inverter generator can be cleaner and safer for your electronics than the electricity you pay for from your electric company! Anything that has a microprocessor is sensitive to the quality of electricity it uses. So not only are computers at risk, but your printer, your TV, your DVD player, and even your kitchen appliances are in danger. Fluctuating power can cause these devices to malfunction. It can even permanently damage them. More often than not, a manufacturer’s warranty will not cover this kind of damage. Long term exposure to fluctuating power can also significantly decrease the life of your devices. Due to the simplicity of conventional generators, they are significantly less expensive. They also have fewer parts, so repairs are also less expensive. But if you need to provide power to devices that are sensitive to electricity quality, you should factor in the replacement costs of those devices. Is saving $500 now on a loud, bulky, gas-guzzling generator worth it? Remember, you will be risking the repair or replacement of the devices you’ll be powering. Running your lights and very basic appliances (like a deep freeze or heater) on a conventional generator makes sense. But if you have a house full of electronics, be sure to unplug them while on conventional generator power. Use them only with an inverter generator! Generators are especially nice to have on-hand during an emergency. But they can be quite useful for everyday tasks too, like powering tools at a construction site, or providing electricity during a camp-out. Choosing the right generator depends on what you need to use it for. The Yamaha EF2000iS is lightweight and portable. While it doesn’t produce enough power on its own to run an entire household’s worth of appliances at once during a storm, it does provide enough power for your essentials, like a refrigerator, as well as phone chargers, or a radio. At construction sites, you can reliably plug your power tools into it, as long as the combined load doesn’t go over the max load. Plus, using the inverter technology, you never have to worry about fluctuating electricity damaging sensitive equipment, such as computers. If you’re thinking about buying a portable generator for camping, construction, or even emergency use, you should definitely consider the Yamaha EF2000iS generator.